After getting this Letters set of Clarity Stamps I was putting words on everything, but this was my favourite one based on what we had seen Barbara demo. The image of the cottage and trees is a complete stamp and I felt it was a cheat just using 1 stamp, so I sponged in some humps of snow in the foreground and still felt I needed to do more.. thats when I remembered my fave little lab silhouette stamp from the Home framer set. Having placed him behind one of the piles of snow I was quite please with the result. 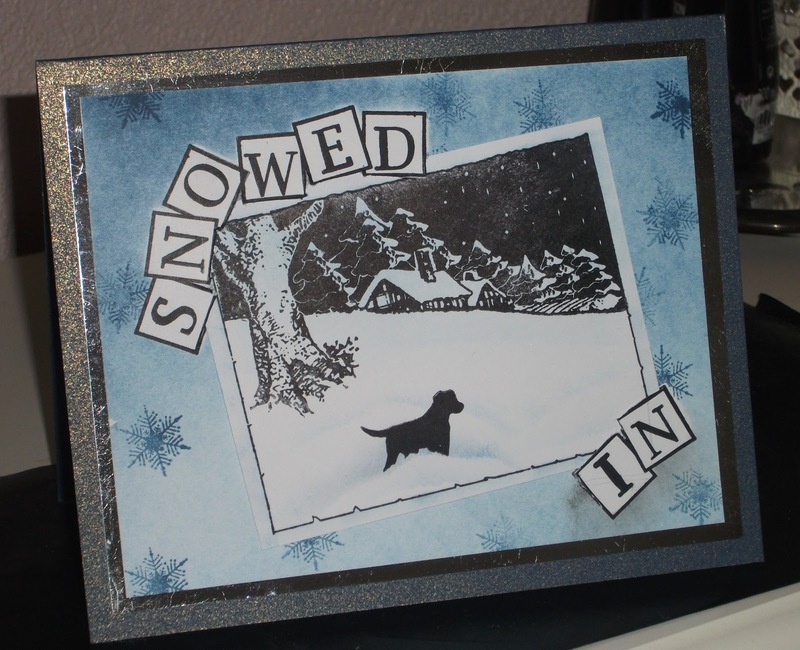 I brayered the background and then the tricky bit working out placement of the letters, originally I was going to title it 'Homeward Bound' but I opted for the easier option of 'Snowed In'. I worked out where to place my letters using the topper I had made...the aim is that the letter blocks will hold the topper by cutting slots under the letters. Once I had got the letters in place I finished off the backgroundwith a fluttering of Clarity snowflakes, cut the slots and put my topper in place. I was pleased with the response I got when i put this pic up on facebook.